Anyone who enjoys building Internet of Things projects may be interested in a new smart cube which has been developed by Ubiqweus and this week launched via Kickstarter to raise the CA$100,000 the team requires to take their new IoT hardware into production. The qBiq smart cubeIs capable of measuring and monitoring for different elements in the form of Temperature, Humidity, Light intensity and Motion. Watch the demonstration video below to learn more about this small Internet of Things device. Introducing, the qBiq: the future of the IoT genre. Our team was determined to provide a better IoT device experience – one that is consumer-friendly, affordable and stylish, offers a broad range of uses around the home or office and has no baseline subscription fees of any kind. Our solution? We created qBiq, the Swiss Army Knife of IoT devices that anyone can easily use to internet-enable any object or space. You’ll eventually always have one in your drawer – just in case. This is made for you – and for your kids, and for your grandmother. 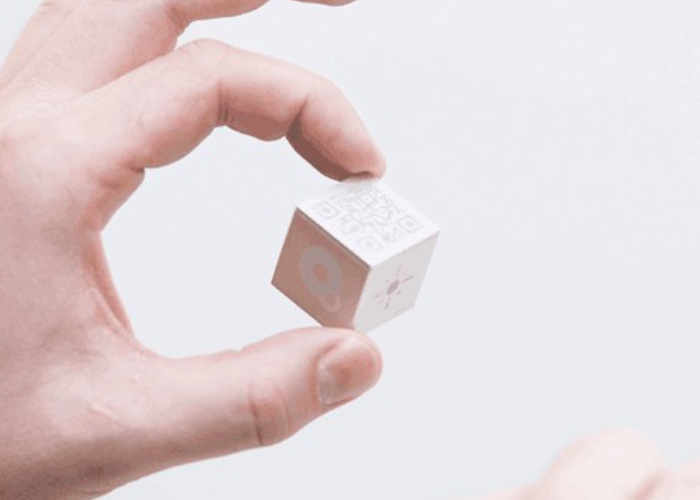 The qBiq is a Wi-Fi-enabled, one-inch cube that connects, monitors, and reports real-time data on any object, appliance, and living or office space to your smartphone or tablet. qBiq is more than a general-purpose Internet of Things (IoT) device; it’s an Internet of Everything device. Internet all the things! The ideal energy efficiency real-time monitoring gadget, qBiq can internet-enable, gauge, and report on almost anything indoors or outdoors at your home, office, or commercial business. You can receive and monitor data on your mobile device using the freely available qBiq mobile application. Each qBiq has a unique QR code and website address that collects and displays data, providing you with real-time information by the minute, hour, day, week, and month. Access and share the data online at your leisure. Furthermore, the data qBiq produces is accessible through open source technology (with appropriate permissions). That means developers can build mobile apps that use the data qBiq gathers for building inspirational new products. For more information on the new qBiq jump over to the Kickstarter website for details by following the link below.